Acid Washing by Lester Pools Inc. Sometimes pools haven’t been cleaned for a long period of time for one reason or another. If you find yourself in that situation, call Lester Pools Inc. and ask us about acid washing. Acid washing is not an easy task, and it must be done safely and properly. Lester Pools Inc. has been cleaning and maintaining pools since 2007, so you can trust that our experienced professionals will get the job done right. Acid washing an extremely dirty or contaminated pool will make the pool safe for swimming. The process removes oxidized metals, algae stains, and foreign particles. It can even In less harmful chemicals that have built up. With the power of our acid wash, Lester Pools Inc. can bring your swimming pool back to life! If a reputable pool service company is what you desire, then look no further than Lester Pools Inc.. Demo Landscaping. For many years Lester Pools Inc. has been providing top-notch, reputable service to individuals in our area and are recommended by our clients on a frequent basis. 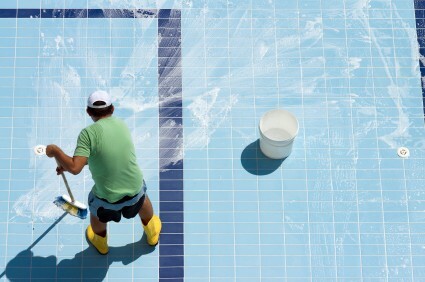 Now is the perfect time to have your acid washing or pool cleaning services met. Contact Lester Pools Inc. today at (732) 201-4521 to see how we can turn your pool back into the place your entire family wants to spend time.